Although this project doesn't have any practical use, it is pretty useful since it nicely describes the use of good old LED as a light sensor. Therefore, LED can be used in two modes; as a photodiode and as LE diode because LE diode is nothing else than specifically doped diode to emit light, packed in transparent case. On the other hand, photodiode is a diode that is capable of converting light into either current or voltage, depending upon the mode of operation. 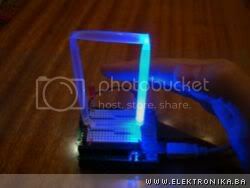 As for this project, it was just necessary to measure voltage on LED and that's it! It is important to note that LED in this mode is sensitive to wavelengths equal to or shorter than the predominant wavelength it emits. The project is realised on Arduino board and source code is available for download.